When I was a little girl, I stayed with my Great-Grandparents a LOT. They kept me while my Mom and Dad worked, and pretty much all the time as I was my Granny’s girl. I have many great memories with them, my Granny taught me lots of things. I remember sitting at her kitchen table with her in ‘my’ seat as she taught me how to color in the lines in my coloring books. Down the little hill in front of their house is a well house, I got in trouble for climbing on the roof, and a stream that went under the road and into the creek. Granny would give me a pie pan and I would go down and make mud pies. Then I’d take them up to the house and tell her I had a pie for her. She would take it and put it in the oven to ‘bake’ for me. She baked her pies, so mine had to be baked too!!! LOL. I also remember sitting on the porch snapping green beans with her in the summer time. So many fond memories, I could go on forever about them! One of my favorite things she made was chocolate gravy. On weekend mornings, my Grandpa would get up SUPER early and begin making homemade sourdough biscuits and Granny would make me chocolate gravy. That was the best breakfast ever, equaled only by my Pa-pa’s graham cracker breakfast (which I’ll do a post about another time!). I asked my Nani, which is their daughter, how the recipe came about and she said all she knew was it was passed down from generation to generation. I make chocolate gravy for my Monkey every once in a while, but it is a treat that I treasure so I only make it every once in a while. It always brings back all of the memories of sitting at the table with Granny and Grandpa. We would sit down, hold hands, and Grandpa would pray that God bless our meal. 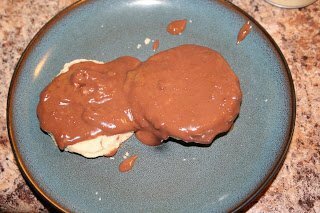 I’ve noticed there are lots of similar recipes online about chocolate gravy, but I decided to post my Granny’s recipe. Mainly as a tribute to the woman who taught me so much about love, marriage, grace, mercy, and helping others. My Granny was a great woman and I’ll always remember her example. She never had a cross word, hated when people yelled and argued, and loved with all she was. She and Grandpa have went to be with Jesus, and I know they are happier there, but I look forward to the re-union we sang about so many times as I sat beside her in church. Okay, before I start getting all sappy and crying, here is the recipe! Pour milk in a small pot, add sugar and coa-coa. Stir constantly. After it begins to get hot, slowly begin adding flour in increments of 1 tbsp each time. When it reaches desired thickness, remove from heat. Pour over biscuits. Personally, I like my biscuits all tore up so that I can dig in, but that’s just my preference!!! If anyone has a good sourdough recipe, I would be thrilled to have it!!! My Grandpa always made sourdough biscuits with the gravy, and nothing can match that taste!!! what in the world?! Chocolate gravy! This sounds so yummy! Thanks so much for linking up to Tuesday Talent Show! I would love to have you stop by and link up again tomorrow with more great projects! Chocolate gravy? Where have you been all my life? My Nana made Chocolate gravy and cat head (they were as big as cats heads’s) biscuits for us too! They are precious memories. Thanks for sharing at Church Supper! You had me at chocolate 🙂 Hope to see you next week!